I typically think of salad with chicken as a workhorse of the healthful culinary world. It reliably gets the job done and can be good, but it is rarely memorable or inspiring. Truthfully, it can be a boring fallback. I suppose I should have had higher expectations when I ordered one at Fume in Napa Valley several months ago. The place was recommended by a culinary-pro local friend, and I was in a mecca of good food and wine. Still, I was taken aback by just how compelling that salad was and how much it stood out from the same-old, same-old. The thought of it stuck in my mind so long I just had to come up with my own version to share with you. What makes this salad so special is its variety of tastes, colours and textures, which makes each forkful a bit different, so eating it feels like a constant discovery. 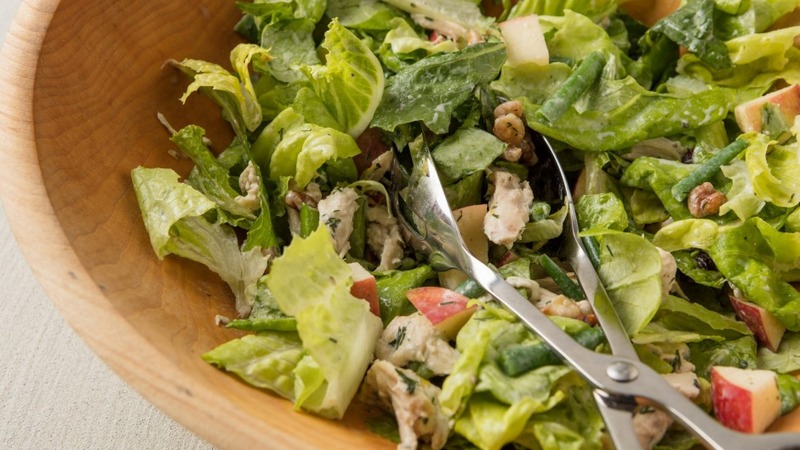 There are two kinds of lettuce - tender Bibb and crisp romaine - crunchy nuts coated in a maple glaze, sweet chunks of red apple, cool bites of celery, the snap of blanched green beans and chewy dried cherries. Rather than the usual cubes of grilled breast, there are tender pieces of chicken torn from half a roasted bird. All the ingredients are coated in a lightly creamy, tangy buttermilk dressing seasoned with fresh dill and scallion. What makes this salad so special is its variety of tastes, colours and textures. This salad might take a bit more effort than adding cooked poultry to pre-washed greens and calling it a day. But most of the elements can be made ahead and you can use a store-bought rotisserie chicken, so the salad still comes together fairly easy, and you will be rewarded in pure delight. This salad boasts such a variety of tastes, colors and textures that eating it feels like a constant discovery. The dressing can be refrigerated up to 1 day in advance. Dress the salad just before serving. 1. To make the dressing, whisk together the buttermilk, mayonnaise, lemon zest and juice, the mustard, salt and pepper in a medium bowl until well blended, then whisk in the scallion and dill. The yield is 3/4 cup. 2. Combine the walnuts, maple syrup and salt in a small nonstick skillet over medium heat. Cook for 3 or 4 minutes, stirring frequently, until the liquid has evaporated and the walnuts are glazed and lightly toasted. Transfer to a plate to cool. 3. Bring a medium pot of water to a boil over high heat. Fill a large bowl with cool water and ice cubes. 4. Add the green beans to the boiling water; blanch them for about 2 minutes, until crisp-tender and bright green, then use a slotted spoon to immediately transfer them to the ice-water bath (to stop their cooking). Once they have cooled, pat them dry and cut into 1 1/2-inch pieces. 5. Just before serving, combine the lettuce, chicken, celery, apple, dried cherries, walnuts and green beans in a large bowl. Drizzle with the dressing and toss gently to coat. Krieger is a registered dietitian, nutritionist and author who hosts public television's Ellie's Real Good Food.